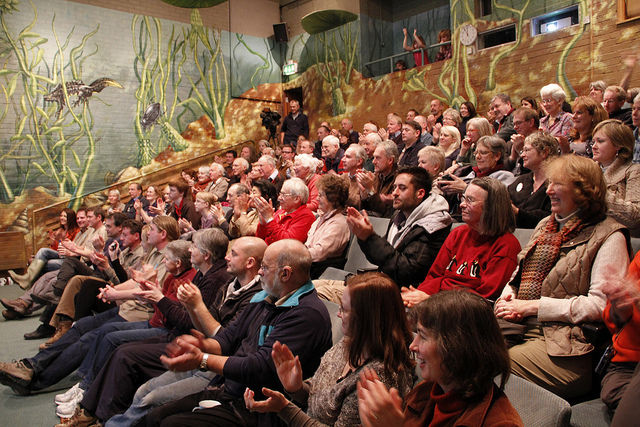 Many thanks to everyone who made it to Slimbridge yesterday. It was fantastic to see so many people turn up in person on a cold winter day. Martin McGill, Roland Digby and Nige Jarrett spoke to a packed room about the ups and downs of the birds’ incredible journey. Look at the Flickr photo gallery. We saw a short film of footage from the expedition, before Kate Humble drew back the curtain to reveal the live video link up with the birds in their specially-built aviary. All visitors to Slimbridge can view the birds over the CCTV link up in the cinema at 2.30pm each day (except Christmas Day, Boxing Day, 29 and 30 December). It was also the day to celebrate the spoon-billed sandpipers’ emergence from quarantine. The birds’ story featured on BBC and ITV news bulletins throughout the day. What an incredible day we had. Kate Humble is such a professional and managed to tease the story out of Nigel, Martin and Rowland in such a wonderful way. I was on the edge of my seat all over again! It was such an honour to meet all the people involved with this bird and the live link-up went so well. Thanks everyone for a great day. I’m still buzzing from it. Wishing you all a very merry Christmas and a successful and happy 2012 for you and the birds. Definitely a success. It was a great privilege to be there and hear the story told so well, and to meet not only the heroes who’d brought back the birds, but the supporters and co-workers who’ve made it possible, not to mention old friends, and of course the real stars – the birds – the live TV link worked well and should be a great way of getting visitors enthused about the project. I was inspired to get the running shoes back on, and at the risk of boring regular visitors to the blog, if you’d like to support my London marathon run for the SBS please visit http://www.justgiving.com/sandpiper.